This still frame from a video released earlier this week by Cal Fire shows the "fire tornado" forming over Lake Keswick Estates near Redding, Calif., on July 26. Now, three weeks later, California officials have explained what happened the night Stoke died in the Carr Fire, which was then just days old. And they have identified his unsettling killer: a tornado of flame, the likes of which the state had never seen before. The behemoth that fire officials describe almost beggars the imagination — but they have video proof, from multiple angles. The footage below was shot from a helicopter. The videos were included in a report released earlier this week by California's Department of Forestry and Fire Protection, or Cal Fire. In the report, officials describe a "large fire tornado" that had formed on the strength of suddenly gusting winds. It had a base wider than three football fields end to end, according to the report, and winds that whipped as fast as 165 mph. Measured on the standard Enhanced Fujita scale, it had the strength of an EF3 tornado. According to National Weather Service data, few tornadoes in California history are known to have reached that high on the scale — and among those that did, none matched the sheer width of what Cal Fire says ravaged Northern California. That's not to mention the heat: Inside the cyclone of fire, authorities believe temperatures surpassed 2,700 degrees F — in other words, hotter than volcanic magma. Video recorded from the dash of an emergency vehicle reveals the blinding orange phenomenon consuming the horizon. "Regardless of the primary factors that caused the fire tornado, the resultant fire behavior was unpredictable and unusual," the report said. "It surprised many highly experienced firefighters." That includes Stoke, 37, a longtime veteran of the fire service who reportedly cut his vacation short to volunteer to fight the Carr Fire. "It's not something that I have ever received training to look out for. It could've been any of us," Redding Fire Marshal Craig Wittner told local media. "It was something out of this world, a perfect storm," Stoke's stepfather, Gary Parmely, told The Associated Press. "It was incompatible with life, and he happened to drive into it." Elsewhere that night, the Carr Fire claimed the life of another firefighter, a bulldozer operator who was caught in the blaze's rapid escalation. To date eight people have died in the wildfire or complications related to it, according to member station KQED. And it continues to burn. The Carr Fire has consumed more than 218,000 acres, making it the eighth-largest fire in state history — for now. With the blaze just 75 percent contained, it is likely to claim a higher position in the state's record books before long. As NPR's Camila Domonoske pointed out, four of the largest fires have occurred in the past six years, an accelerating pace that experts link to climate change. The state's largest-ever wildfire, the Mendocino Complex Fire, continues to burn in its own right. 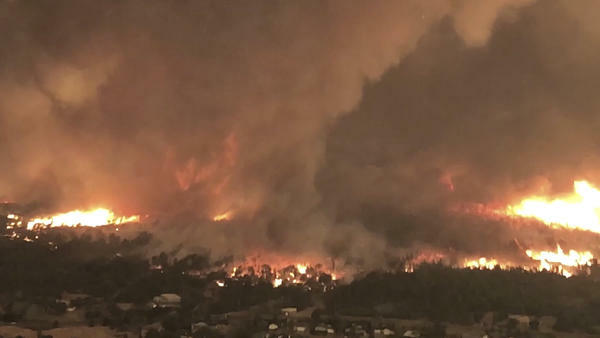 At more than 375,000 acres, the blaze has ravaged an area larger than Los Angeles — and its largest branch stands roughly 25 percent from full containment.